M. C. Buckingham writes to thank Miss Berry for the fruit cake she sent and says that it's always nice to be remembered by friends. Buckingham hopes that 1930 holds only good things for Miss Berry and the Berry Schools. In this note, Mrs. Blossom thanks Miss Berry for the Christmas card and fruit cake, but requests that in years to come, Miss Berry send only a card as "none of us eat cake or candy." 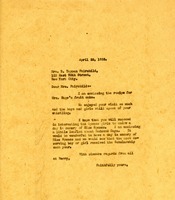 Handwritten across the top is "cake" and along the side: "Do not send eats." Achelis thanks Berry for the Christmas fruit cake and sends good wishes for the new year. 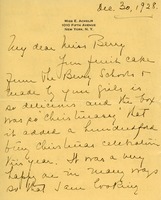 Lists of people receiving presents (fruit cakes, angel food cakes, lavender bags, paper knives, candy) from the Berry Schools at Christmas in 1927.